I was inspired by the gold lettering against the black background, the oval wreath and “year” themes. I love metallic colors against black, especially gold against black. Metallic colors really seem to pop against a black background. The “this year” sentiment also made me think about the coming New Year. We’ve almost finished the first month of the New Year, and I only just made a card to celebrate it. Maybe one of my resolutions should be not to procrastinate. 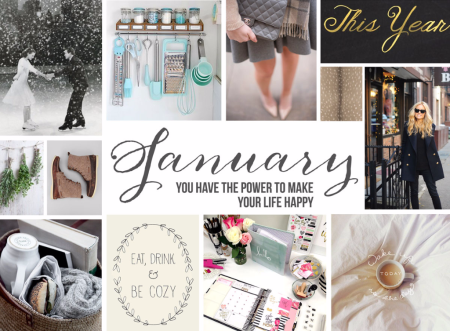 I know one of my resolutions should include posting the cards I make more often on my blog. I make more cards than I actually post. However, by the time I’m finished with a card design (and I really agonize over the designs), I’m exhausted. So the idea of writing about the card sometimes becomes overwhelming. But I really need to do more posting. I’m crossing my fingers that I’ll do more postings. I cut a piece of A2-sized black cardstock along the diagonal. Then, I chose a complimentary pattern from my cardstock pad (gold dots against a cream-colored background); cut an A2-sized piece of the patterned paper along the diagonal as well. I now had 2-pieces of cardstock that I could mount onto an A2-sized mat. After mounting the two diagonally-cut pieces together, I die-cut a wreath in gold foil cardstock and mounted it against the patterned side of the card front. 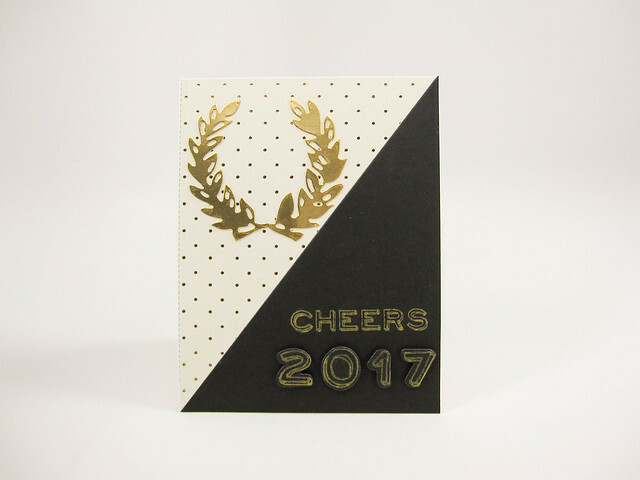 I then stamped the word “cheers” from the Essentials by Ellen Advent stamp set onto the black side of the card front using Delicata Golden Glitz ink. I had to stamp the word several times to get the impression I wanted (thank God for my MISTI!). I also stamped the numbers 2, 0, 1, and 7 from the same stamp set onto a scrap piece of black card stock in the same gold ink. Again, I had to stamp the number several times with my MISTI to get the proper coverage. I die cut the stamped numbers using the coordinating dies for the Advent stamp set. The numbers were adhered underneath the “CHEERS” sentiment with tiny black foam adhesive pieces. The entire card front was mounted onto an A2 top-folding card base. So there you have it! An almost-one-month-old New Year’s greeting card! Better late than never. But sincerely, to everyone reading this post, I wish you a very happy, healthy, exciting New Year brimming with creativity. Stamps: Essentials by Ellen Advent stamp set. Dies: Essentials by Ellen Advent coordinating dies. Cardstock: My Mind’s Eye: Yes, Please 6×6 cardstock pad; DCWV: gold foil cardstock from foil pack; Papertrey Ink: True Black (100#); Neenah Solar White cardstock (110#). Ink: Tsukineko: Delicata Ink in Golden Glitz. This entry was posted in Challenges, Holiday Cards and tagged Ellen Hutson, Essentials by Ellen. Bookmark the permalink. ← Happy Year of the Rooster!